Great looking and very high quality. 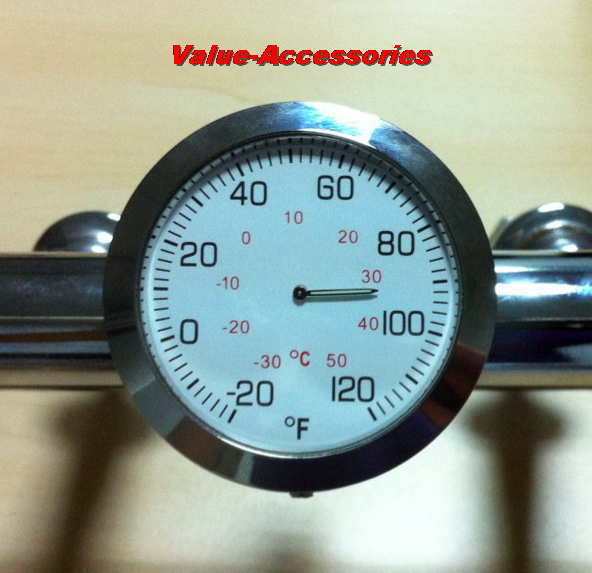 Best deal we have in Thermometers. You will be really surprised at how good these look. Great for motorcycles, bicycles, atv's, anything that moves. Fits over the bar like a saddle. Secured by a discreet, stainless steel set screw. Size: 2 1/4" total Diameter, Thermometer Diameter 1 3/4". Decide on location. Location must be a straight area. If not straight you may use Rubber Tape instead of the supplied Bushings. INSTALL appropriate Bushing at installation location. Middle size Bushing will fit 1" Bars. Using supplied Allen Wrenches REMOVE Thermometer from housing by LOOSENING the Set Screw from the outside of Housing. Using the supplied Wrench, REMOVE Thermometer housing from the Upper Clamp Half. Using supplied Allen Head Bolts, INSTALL Clamp Assembly together over the Bushing. VERIFY correct location before tightening. VERIFY the Housing Set Screw is Lined Up with the Dimple in the Thermometer. TIGHTEN Clamp bolts evenly at the same time. INSTALL Thermometer in Housing and TIGHTEN the Set Screw.